EAF Inc. custom designs and fabricates test stands and customized products for flexible manufacturing cells. This modular aluminum test stand was designed for leak leak testing when the water pump was secured to the water pump housing. 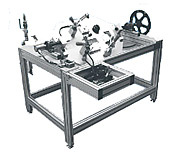 Modular aluminum test and assembly station was designed for checking the bolt torque when the water pump was secured to the water pump housing.